misses our key point: American and United/Continental are hypocritically and publicly touting their commitment to environmental protection while simultaneously working actively to undercut the world’s first program to reduce carbon pollution from aviation activities. Below is our original post. EDF joined five other major environmental groups today in denouncing American, United and Continental airlines for working to gut anti-pollution programs while simultaneously bragging about their environmental performances. The companies each touted their environmental responsibility around Earth Day last month: American in an article in American Airlines in-flight magazine, and the newly merged United and Continental in the description of their new “Eco-Skies” environmental campaign. Meanwhile, these airlines, along with the U.S. airlines trade group Air Transport Association of America, are suing in the European Court of Justice to block a new law that holds all airlines accountable for their global warming pollution resulting from flights to, from and within the European Union. The companies are also lobbying the U.S. Congress to declare the EU law invalid. “spending [their] customers’ money on lawyers and lobbyists in an effort to thwart a crucial anti-pollution program”. 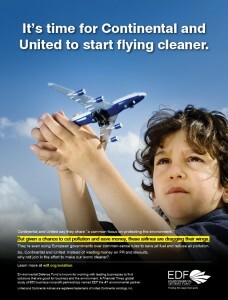 drop the lawsuit, and join the future of low-carbon aviation by making your actions consistent with your words. The amount of global carbon emissions from aviation is expected to grow 3-4 percent per year. EDF, CBD and Earthjustice have intervened in the litigation in support of the EU, as part of a trans-Atlantic coalition of environmental groups. Oral argument for the case is expected in Fall 2011. 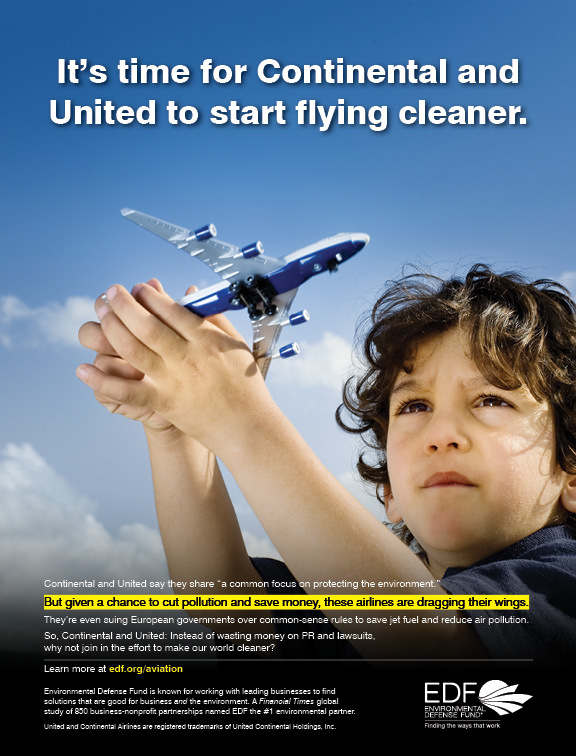 EDF submitted the above ad to United and Continental Airlines' Hemispheres magazine, and a similar one to the American Airlines' American Way magazine, urging the airlines to "start flying cleaner." EDF today also submitted advertisements to American Airlines’ American Way and United/ Continental’s Hemispheres in-flight magazinesurging the airlines to start flying cleaner. EDF has requested the airlines respond within a week indicating whether the ads will be accepted for publication. This entry was posted in Aviation, News. Bookmark the permalink. Trackbacks are closed, but you can post a comment. ClimateTalks is now posting on Climate411.